The post-college job market is still very tough. 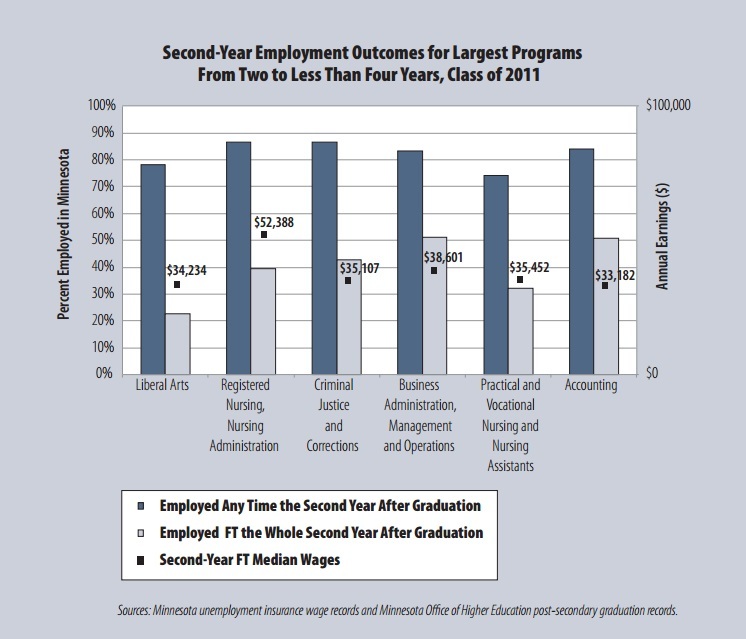 Three of five Minnesotans with a bachelor’s degree don’t have a full-time job in their second year after graduation. 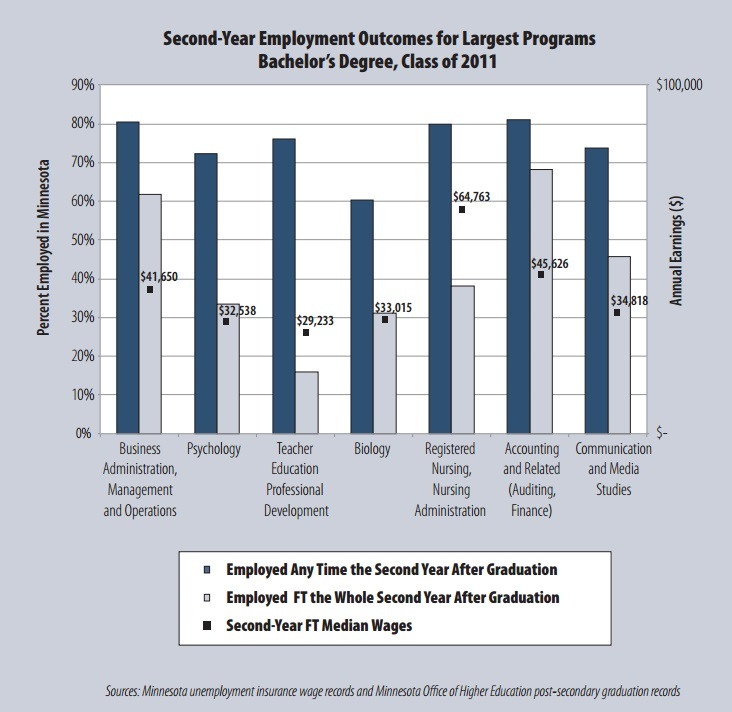 Neither do two out of three Minnesotans with a new associate’s degree. Those findings and several others come from a new piece by Alessia Leibert, an analyst at the Minnesota Department of Employment and Economic Development. Minnesota is among 29 states participating in the Workforce Data Quality Initiative, a program funded by the U.S. Department of Labor. Leibert took a look at the new set of data that combines education and workforce statistics to give a picture of how 2011 college graduates are faring in the job market. Not all courses of study are equal, of course. Among two-year degrees, precision metal working gave graduates the best chance of having a full-time job 12 months after graduation – about 45 percent. 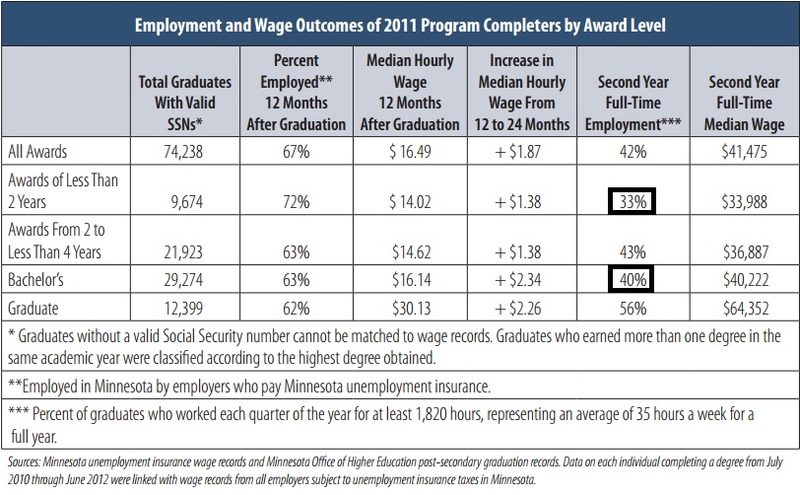 And the median second-year wage for those graduates is $39,246 per year. People with training in business and accounting fared better than their peers. Half of those with more than two-year degrees but less than four-year degrees in business or accounting had a full-time job for the full second year after their graduation, compared to just over 20 percent for those with a two-year liberal arts degree. Meanwhile, for those with a bachelor’s degree, accounting and business offered a better than 60 percent chance of a full-time job after 12 months. Fields of study like psychology, education, biology and even nursing appeared to offer less opportunity. The Star Tribune's Joe Christensen and David La Vaque discuss whether the top players who leave Minnesota high school hockey early really benefit when it comes to the NHL draft. A recent inductee into the U.S. Hockey Hall of Fame, Natalie Darwitz has taken Hamline's women's program from the ashes to a runner-up finish at the NCAA tournament.